I knew the XA was "small"
That's the wrong adjective, actually. This thing is positively tiny! I received my Olympus XA just a couple days ago, and was absolutely floored by how tiny this thing is. It's fully 25-30% smaller in every dimension than what I was picturing. I really didn't realize how small 35mm cameras could be, never having owned anything of the sort. My first impressions are very positive. It's a camera that I just really want to take everywhere. The body is plastic, sure, but the mechanism works with a satisfying "click", and it doesn't creak or flex. Same with the control levers: nice action and positive clicks. I even like the frame advance. Obviously, the rangefinder viewing and focusing experience is a trade off. I sometimes have a hard time finding just the right spot that lets me see the shutter speed readout and framelines, and the focusing patch is a little tricky to use even in broad daylight. Definitely slows down my shooting, for better or for worse. I'm sure it gets better with practice, but I think I had set my expectations accordingly, so I'm not disappointed. I like that it feels like a complete and "real" camera experience. Aperture priority shooting, the +1.5 exposure comp. lever, shutter speed display, 1/500ths and ISO 800... clever and usable camera. And beyond that, it has a lot of personality: it's so cheap and cheerful. Bad news is, I'm already wanting to get another&mdash;maybe an XA4 for low ISO landscape and cityscape shots, or any of them really to have different film loaded up. One daytime, and one evening camera. Trying to convince myself just to wait for a cheap one to pop up, haha. It's really small... And it's ready for shooting, everywhere, always: that's IMO its biggest strength. Its focusing is its weakness, at least with mine... I keep it at f8 and prefocused at 8 feet. And that +1.5 is great! F i l m means fun! Now the agonizing wait for the first roll to come back from the lab. Not sure how the light seals and meter are, yet (though meter seemed right based on my rough calculations). I do enjoy using mine. It took a little getting used to the focusing lever being at the front and bottom. But I like its portability. In a way, it's like Olympus's body cap lens for the micro 4/3 system&mdash;which I have&mdash;pays homage to the XA with its little focusing tab. I love mine. I find focusing a bit tricky so I usually zone focus like Juan. 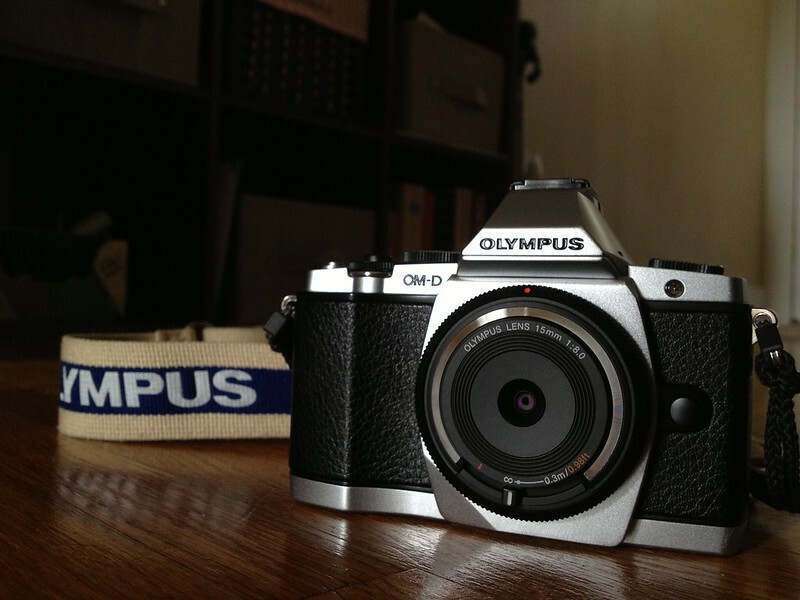 It's a great inconspicuous camera for street photography. Very non-threatening, unlike a DSLR. A take-everywhere camera. Mine is usually loaded with HP5 or Tri-X. Enjoy! I love my XA. So much I bought a second one several years ago. I shoot it with Portra 160, or Tri-X. It's my favorite pocket cam for vacation travel. I like the character of the lens wide open and stopped down. Yes, focusing w/ the tiny rf patch is a challenge, but you can always zone focus. I intend to have it in my pocket next Sunday when my daughter gets married... it's the same camera I had in the delivery room when she was born. I intend to have it in my pocket next Sunday when my daughter gets married... it's the same camera I had in the delivery room when she was born. If your after a second one you might want to check out the xa-2 or xa-3. I have had all the xa series, and the xa-3 is one of my favorites. The instantiation of "punching above its weight," for sure. Only little camera I've liked as much is the Ricoh GR-1. The XA was the fourth RF I bought this year (switched Bessa for M5, picked up a GSN and gifted it to my mother, switched X100 for M8) after my Leica broke in SF. I very much fell in love-- I knew RFs were small, but nothing like this. Took it to the Space Needle with my brother on his birthday today, and after trying to explain to him why I shoot RFs, I pulled it out to demonstrate. I think we might have another one hooked. shot from the hip with hp5 xa. XA2 is almost too small for me, I don't regret not having tiny RF lever. Aperture preselection of XA is useful, though. Look on the bright side: Some cameras aren't even worth repairing. The XA clearly is. I looked at your flickr stream for the body cap lens and was quite impressed. If you can ignore the irresponsible use of in-camera art filters, it's actually a fairly sharp lens. But more than anything, it's just fun to use. I'm due for another outing with it. Rocking shot. It's the camera to take when "No photography allowed". Ah, that Ricoh. One day I'll get my hands on one of those sweet little machines. Yeah. A little show and tell is probably all it would take. The XA is its own best advertisement. You have to see it to believe it. That's awesome. Love that sense of continuity. My XA seems to have repaired itself. Odd. May I offer a tip for focusing the XA? Wrap the fingers of your left hand over the top of the camera, and use the thumb on your left hand to move the focus lever. That makes it a lot easier than trying to find the little lever with your index finger. I hold my left hand slightly underneath the camera, almost as I do with cameras which have projecting lenses. I use the tip of my middle finger to focus. I had to reach for the camera and put it to my eye to work out how I held it.